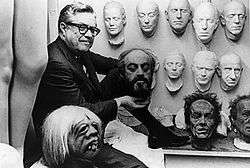 William J. Tuttle with some of his creations for MGM in 1970. William J. Tuttle (April 13, 1912 – July 27, 2007) was an American make-up artist. Born in Jacksonville, Florida, at a young age he was forced to leave school to support his mother and younger brother. After a series of odd-jobs and a brief stint in his own band, Tuttle moved to Los Angeles in 1930 and began taking art classes at the University of Southern California where he would meet his future collaborator Charles Schram. Around the same time, he began working as a page at Fox Studios. He went on to work under makeup artist Jack Dawn at Twentieth Century Pictures. In 1934, Tuttle and Dawn moved to Metro-Goldwyn-Mayer. Working as Dawn's assistant, Tuttle supervised the makeup work in such movies as The Wizard of Oz and Father of the Bride. In the 1950s he would be responsible for the makeup in Singin' in the Rain, Forbidden Planet, North by Northwest and The Time Machine. He reused pieces he first created for The Time Machine in The Eye of the Beholder, one of his many Twilight Zone contributions. In 1965, Tuttle received a special Academy Award for his work on George Pal's 7 Faces of Dr. Lao; this was 17 years before makeup became an official Oscar category. Later work included Logan's Run and Young Frankenstein. Tuttle is the subject of the 1968 MGM short The King of the Duplicators where he demonstrated some of his work. He also appeared as himself in the documentary film The Fantasy Film Worlds of George Pal (1985), produced and directed by Arnold Leibovit. Later in life, Tuttle managed his company known as Custom Color Cosmetics. William Tuttle died, aged 95, from natural causes at his home in Pacific Palisades, California, survived by his wife, Anita and his daughter, Teresa. His remains were placed in Minneapolis, Minnesota's Lakewood Cemetery. William Tuttle was married five times. He was the first husband of Oscar-winning film and television star Donna Reed. He was survived by his daughter, Teresa, and predeceased by his son, John (both children were from his marriage to the late Marie Kopicki). ↑ Nelson, Valerie (3 August 2007). "William J. Tuttle, 95; pioneering film makeup artist was first to get an Oscar". Los Angeles Times. ↑ Van Gelder, Lindsy (March 1998). "Screen Savior". Allure. ↑ "William Tuttle Gets Acad Award For 'Lao' Makeup". Hollywood Reporter. 29 March 1965. ↑ Fox, Margalit (August 4, 2007). "William J. Tuttle, Master Movie Makeup Man, Dies at 95". The New York Times.